One of UCT’s oldest benefactors, the Hospital Welfare and Muslim Educational Movement (HWMEM), has once again rallied to support disadvantaged students. 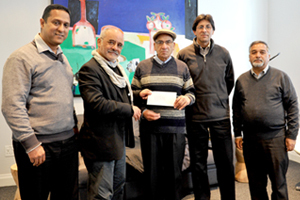 The group presented their annual bursary cheque to UCT deputy vice-chancellor Professor Crain Soudien on 20 September. The funds will support 14 students. The HWMEM has been a loyal supporter of UCT students since the early 1960s when it set up its bursary scheme. Although the community-based organisation was established to cater for the nutritional needs of Muslims at Somerset Hospital in the mid-1940s, it later grew to a welfare programme for the broader community. It now assists students in higher education on an entirely open basis and recently extended support to students outside South Africa.